Just don’t look at the paint job! 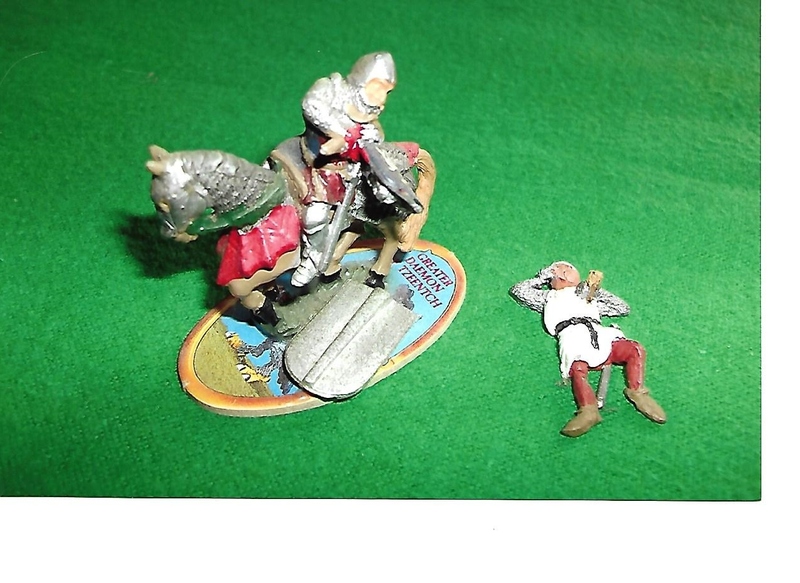 These are veteran figures, big 25mm Wargames Foundry from the 1990s, I believe, and were produced in the Barons War range covering the 13th century, possibly from old Citadel moulds. I bought a pile of them, over a hundred, in a car boot sale. Good value too, but the painting, well, oh dear! Anyway, these are two of the odder figures, the poses and types that many manufacturers include in their lists but probably don’t sell that many of. Wounded and injured individuals don’t pull their weight financially in the composition of a tabletop army, do they? That’s one of the reasons why many of my existing casualties are from old Airfix or Atlantic plastic sets, all being posthumously cheap! So, I’ve got these two. They’ve both strayed too close to the enemies’ arbalests, and suffered to their cost. The prone foot soldier’s usable as he is, maybe a bit too glossy, but he’ll find a place next to a bombard or at a breach of a wall. The knight, however, is not so easy to deploy, unless in a diorama. I’ve temporarily based him on an old game counter, and I laid a 30mm pavis below the horse’s hooves. He’s gone very close to the crossbows, obviously. It happened to Richard the Lionheart, but it doesn’t make it any easier to use the figure — man and horse are one piece, by the way. Is it worth a repaint job? The charging knights, those with mace and sword and lance are all good, but this one? I suspect he’s a commander as he hasn’t even drawn his sword, but what, in a wargame, shall I do with him? This entry was posted in Periods - Medieval. Bookmark the permalink. 1 Response to Just don’t look at the paint job! Turn them into a vignette! Vignettes – little dioramas – really enhance the visuals of any wargaming table. Alternatively, you can use them as markers to place next to units to indicate morale status or something like that.